The Santa Bag is just the cutest bag ever!!! Sew easy to make and sew many sizes available!! Choose your Santa Bag size according to your content. Each size will hold various size wallets, cell phones or tablets and so many other goodies. The small sizes are perfect for a little girl in your life to carry. The larger sizes make a great hands free bag to carry during your holiday shopping adventures. All sizes have a zipper closure keeping your valuables safe inside. Add a long strap to wear it cross body style as a purse, a short strap like a wristlet. So many possibilities!! 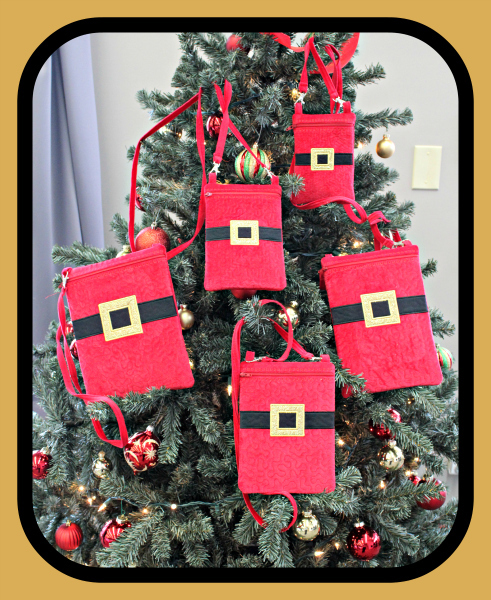 The Santa Bags come in 5 sizes and you are sure to find a size that is perfect for you! There are two files to each bag, a “back” and “finish”. The entire Santa Bag is not only quilted but completely finished in the hoop in just two hoopings with no raw seams showing inside. Quick to stitch and sure to please, even St. Nicholas would approve!! This page is for the Large Set of Santa Bags. If you want the small set which includes the 3 smallest sizes, click here. OR if you want ALL sizes which is the best buy $$$, click here. Many hoop sizes included: XLG-8" X 12" AND JUMBO-9" X 12"
XLG Santa Bag - 7" x 10"
Jumbo Santa Bag - 8" x 10"
Let your friends know about my site.